First there was the Armodoc, then there was the Syclodoc. Early this year it evolved into Syclowave, a big purple guy inspired by Phil Reed of Battlegrip.com as well as Transformers. It sold out incredibly quickly, no doubt due to it being a relatively new head design combined with an awesome homage and the generally rabid nature of Glyos fans. It hasn't exactly caught fire on the secondary market, which is good as it means you may be able to get one at a price that's not too high... the few on eBay as of my writing this didn't sell due to the higher starting bid prices. If you ordered one or more Banimon figures a few weeks ago, ship notices are starting to go out now - I got mine just yesterday. Watch those mailboxes! And inboxes! And if you didn't order any, click here to see which ones are still available. 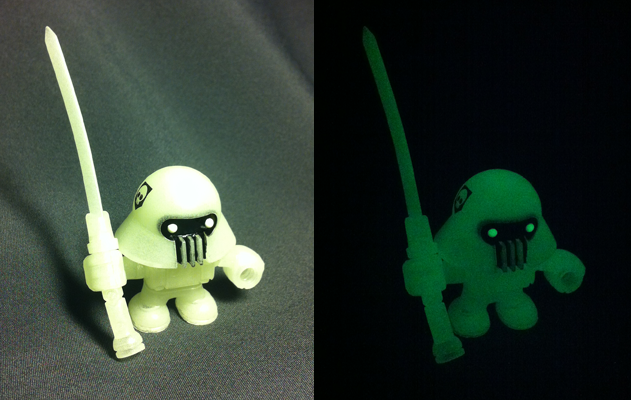 Boris at the Planet Banimon Shop has added his two latest figures - now in blue as well as glow-in-the-dark! You'll probably want to get these. They're $7 per, and a pair is about $20 shipped. Click here to see what's left. The glow in the dark seems to be selling the fastest right now. UPDATE: The glow-in-the-dark figure sold out quickly! Hope you got yours. I really don't know why the Gendrone Legion Gobon didn't sell out immediately. It took a while. I had no idea this color scheme was coming, but I had incorporated it into the Glyos News Dump header [archival ] because I thought it looked cool. Who knew that I would have a figure of it in a few months? There have been nearly 20 of these guys, not including a few limited editions, and historically they seem to be, sadly, slower sellers. The portly robot is probably one of the best bangs-for-the-buck in Glyos in terms of mass and options as you get a reversible head, a hidden second head, plus a body which can be flipped and made to look like a comical, portly fellow or a more aggressive bot of death. I don't know the exact name of the cybernetic Battle Beasts-esque Rhinoceros head as the package didn't have one, so I'm calling it a CyberRhino head here. As with other releases in this hand-made series, the head was sculpted by Jason Frailey (the guy who sculpted the Armorvor) and was molded by the GodBeast, debuting at C2E2 last month. Most of his heads debut online and are ordered through the October Toys forums, cast in resin so you'll need to be careful with them. 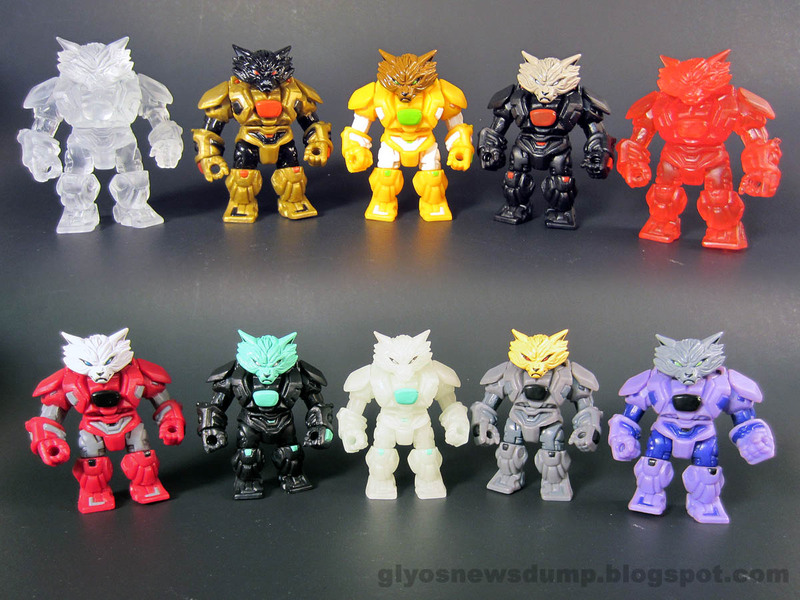 Sadly these heads have yet to be cast in PVC, the kind of plastic used for most Glyos figures. If I could, I'd love to invest in getting these cranked out on a larger scale just so I could have more of them. There's a prolific sculptor, molder, and maker of toys known as "TheGodBeast" who is best known for making very small runs of very impressive things. He's prototyped numerous designer toys, created fully-realized figures based on sketches from years earlier, and lately he's become particularly well-known in Glyos circles with custom heads and other parts. The Armorvor Infection has some nifty history behind it. Mr. Beast (also known as Marty Hansen) worked on the creation of this mold as the molder, with Jason Frailey having sculpted it and Matt Doughty having designed it. The "Infection" color has been used for numerous special-edition figures in the past as well as hand-cast resin pieces, plus the red just happens to match clear red Outer Space Men figures and a pair of recently released figures at Onell Design: a Crayboth, and an Exellis. Wow, that's a lot of exposition. Hooray! The Banimon Glow in the Dark Ghost Troopers Reveal in the October Toys forums confirms that these are indeed glow-in-the-dark action figures. May 17 in the Banimon Shop! Be there, or don't! While there are no pictures, the guys at Banimon announced the next figure drop is May 17, 2013. 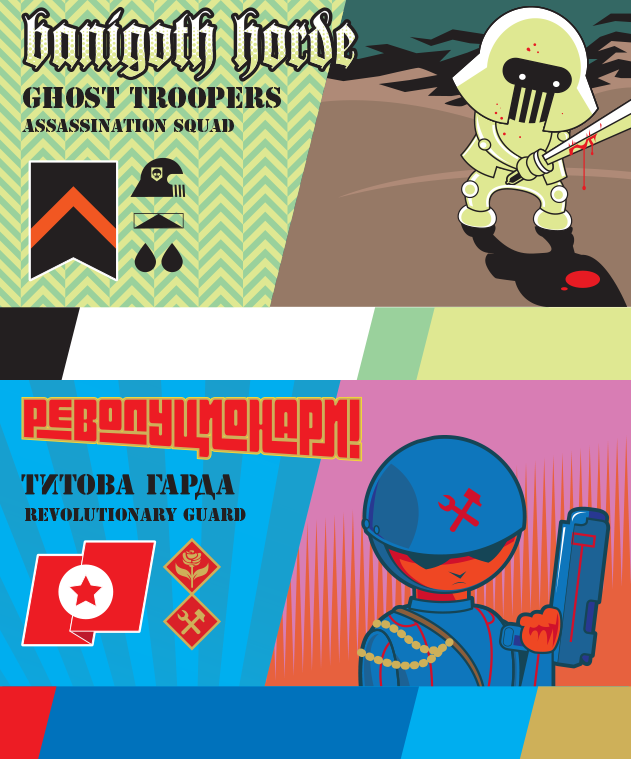 Ghost Troopers and the Revolutionary Guard were listed, which could be... well, anything. Probably the blue guy we saw the other week. 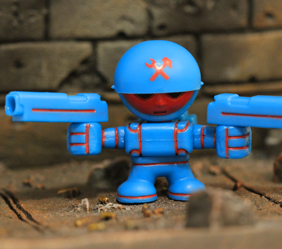 Also, don't forget the Spy Monkey Creations Weaponeers of Monkaa Drop was today and fewer than 100 of each style remain. While not a figure, the Red Swing Joint Set is another way to expand the functionality of your figures from Onell Design. While creator Matt Doughty is already using these parts to make all-new creations, most of us will be using them to add knee and elbow articulation to new and existing figures. For $4 (or $3 if you took advantage of the black ones) you get enough parts to upgrade half of one figure - so if you want to give a Glyan knees and elbows, be sure to order two sets. The good news is that the resulting figure is quite impressive, but unfortunately Swing Joints effectively double the cost of the figure.